City of Oxford Swimming Club stormed through to round 2 of the 2017/18 National Arena Premier Division South League in impressive style. Leading from the start to finish City amassed 242 points, with 27 first and 11 second places from the 50 events. This is an annual fiercely fought, competition to determine the top swimming club in the country; 400 teams and circa 16000 swimmers compete in six leagues around the country. The winners of Oxford’s regional premier league will qualify for the National Arena Swimming League Cup Final in April 2018. 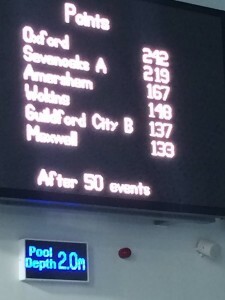 Full results from this round one gala, hosted for the first time by Oxford at Blackbird Leys swimming pool, were City of Oxford 242, Sevenoaks 219, Amersham 167, Woking 148, Guildford B 137 and Maxwell (Aylesbury) 132. The decisive victory was even more noteworthy given that Oxford went into the pool as second favourite to Sevenoaks. The atmosphere created by the teams and their supporters was electric with the patient and understanding referee pleading for quiet on a number of occasions. As well as the 22 expected individual winners, many of whom swam personal best times, the decisive overall victory came as a result of a number of swimmers exceeding their anticipated finishing position, in their individual events; specific mention goes to the following team members who bettered their expected finish position and gained valuable, unexpected, team points; Emily Wood (Ladies Open 200 IM); Juliet Anthony (Girls11/U 50m Back/s); Lachlan Middleton (Boys11/U 50m Back/s and 50m Fly); Jamie Conway (Boys13/U 100m Br/s); George Rudd (Boys15/U 100mBack/s and 100mBreast/s); Charles Pauling (Boys13/U 100back/s); Nina Brown (Girls11/U50mBreast/s); Freddie Cooke (Boys13/U 100 Fly); Mihailo Petrovic (Boys 13/U 100 Free) and Daniel Jenkins (Mens Open 100 Free/s). The next round of the competition takes place on 11/12 November 2017. Finally a huge ‘ thank you ‘ to all the COSC volunteers and coaches who worked so hard to ensure that this important swim meet was managed so professionally and efficiently. They are a credit to both the club and the city of Oxford and we hope that as a result of their hard work and effort Oxford will be selected to host similar future events.